Found objects and other has-beens figure prominently in the installation by poet/artists Steven B. Smith and S. Judson Wilcox at Spaces. Once again the pair scores in a joint enterprise with a blasphemous edge, but some of their materials might have been better laid to rest. The installation is the third in the Smith/Wilcox collaboration in the "Cleveland Works" series, this time with participation of scene designer Beth Wolfe. 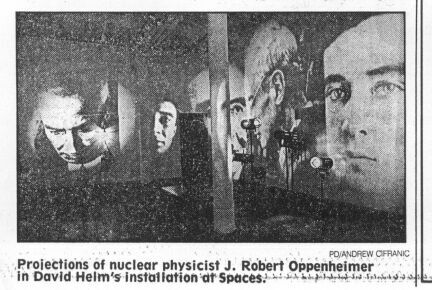 Also shown at Spaces through next Friday is "Testing. . .1 . . 2. . .3," an installation by David Helm of Chicago focusing on the late J. Robert Oppenheinmer and the advent of the Nuclear Age. Vast differences between the two include a spontaneous approach in "Cleveland Works" as opposed to a highly controlled technical presentation in "Testing." Smith and Wilcox have formed a special kind of kinship in creating environments that alter common objects' context. Here they provide an even more ambitious display of component shrines to (among those identified) Smith's deceased brother, Elvis Presley, "the might and misuse of the media," Jayne Mansfield, "life, death and the American way" and the iconography of the Church. Wilcox, who now lives in Boston but returned for the show, calls the installation "a cultural cathedral, from the tawdry to the absurd." Smith regards it as "an affectionate mocking of organized thought, or thoughtlessness." Both minimize its macabre, potentially offensive and juvenile aspects. Moreover, "Cleveland Works" lacks a clear concept. It comes off as a mildly intriguing but blankish hodgepodge of leftover popular/junk/consumer culture objects and scarred symbols of other's religious belief. In the case of the shrine to Smith's brother, it also injects an ill-fitting, unsettling confrontation with death in the form of the brother's crematory ashes. The propriety of exhibiting cremation ashes isn't a problem for Smith, despite the trauma of his sibling's suicidal death. Smith reportedly had a mutual pack with his brother, who was also an artist, that the first to die would be included in an exhibition of the other's work. 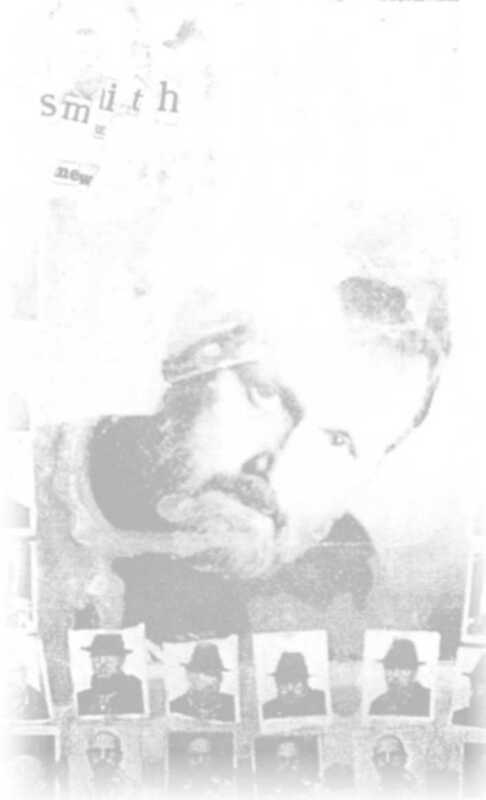 The setting for the ashes (in a broken plastic bag, beside the mailing box) includes a video heart monitor registering a straight line (meaning no heart beat) to underscore the point. Columns, a classicizing motif in Wilcox' oeuvre, are big in this piece, as are television screens. They merge in a columnar stack of 10 plugged-in TV sets suspended from the ceiling - quite a feat. Other recurrent items include religious iconography and knick-knacks, American flags, mirrors, plaster busts and pedestals, trophies, street signage, skulls, plastic angels, industrial glass tubes and dress dummies. There's also a pair of 1950s gas pumps (flanking Elvis' heavenly portrait) and even a spray painted portable organ. But there's none of the whimsical elegance of Wilcox' signature white-glazed sculptures of everyday objects that lent unity to past installations. Helm's "Testing" installation, set off by itself, is a tour de force of multiple projection. Surrounding the viewer in the darkened room are portraits of chief A-bomb developer Oppenheimer in different stages of his life, culminating in a tortured image of social conscience. It's part of a series on American "folk heroes," in this case reflecting on the anxieties and issues that surfaced in the post-Los Alamos 1940s. Taped nature sounds (birds, loons, a thunderstorm) punctuate the strained and dramatic silence. Helm, a trained anthropologist as well as an artist, teaches at the University of Illinois at Chicago. Spaces, 1216 W. 6th St., also will be the setting of a program of controversial New York performance artist Diane Torr at 8 tonight. Tickets are $5.